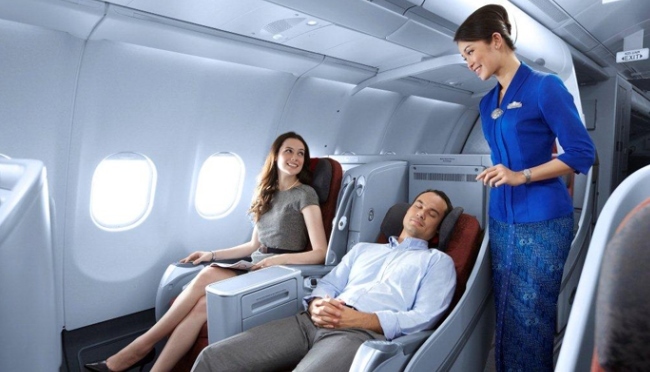 For many luxury travellers Garuda's reputation precedes it - which until recently has not necessarily been a good thing. However, this is an airline that has done a U-turn in the last few years with a fleet of young planes and a new and improved business class. By 2015 the airline will be operating 194 aircraft, with an average age of less than five years, which is impressive. This year the Boeing 777-300 ER also joined the fleet, allowing Garuda to fly non-stop from London to Jakarta. Sceptics may be surprised to learn that the airline has also been picking up a few awards of late (World's Best Regional Airline from Skytrax and The Best In-flight Meals in the Asia Pacific Airline Food Awards, to name but two). But were WE impressed? Read on and see. 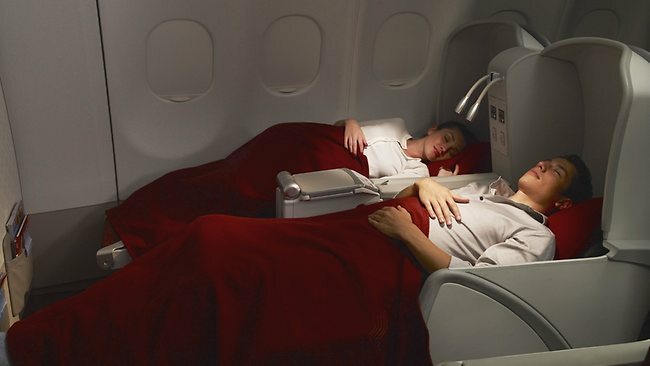 The seats are laid out in a 2-2-2 configuration, cocooned-in like giant baby capsules with central privacy screens. The cabin feels modern and spacious. Brownie points for the in-seat lumbar massage function and the 74 inch (104cm) seat pitch. Certainly. I'm particularly fond of the thick and fluffy maroon-red blankets on offer. The seat converts to a completely flat bed (I don't care what ergonomics experts say -that's how people like it) and the in-arm adjustment console offers a touch sensitive variety of graduated seat positions so you can pick your preference without being put into automatic pre-set positions (although there is that option too). The in-flight entertainment system, is touch sensitive on-screen. The monitors are wide. The movie choice is...not so wide. Not up to slick Cathay Pacific standards perhaps (link to Cathay article) but just enough to entertain me all the same. Even more entertaining were some of the categories I find the movies under - Charlie and the Chocolate factory under 'Action /Adventure' for example. Games and audio tracks are also available. If you want BYO movies, you can plug in a USB stick and there is a universal AC power point for laptop charging. Staff are attentive and helpful; dealing gracefully with all-comers. Love those jewel-bright blue uniforms too. Meals are presented on a tray with a crisp white cloth, actual salt and pepper shakers and all-metal cutlery. Maurice Leger champagne and juice are offered on boarding. Pre meal canapés are unusual (what was the bright green one?) but tasty. Indonesia choices - sate, gado gado - are delicious. Wines are mainly French. The amenities kit has L'Occitane lip balm but apart from that little treat just a basic selection of socks, eye mask, toothbrush and comb. However In the toilets there is L'Occitane moisturising lotion, aftershave and a perfume spray. Although, lovely as it is, you can get a little sick of the scent inflight when other passengers are too liberal with the spray. Actually this is quite a BIG thing. Not only is you visa payment taken care of as you check in but you actually get in-air passport and customs clearance. (at first I thought the immigrations inspectors, coming down the aisles with trolleys were serving duty free.) Making the exit from the brand new airport in Denpasar both air-conditioned and hassle free. All you have to do is wait for your bags - and in this case our priority luggage tags actually worked! Another plus is a whopping 40kg luggage allowance and free sports equipment carriage. Good even for business class. 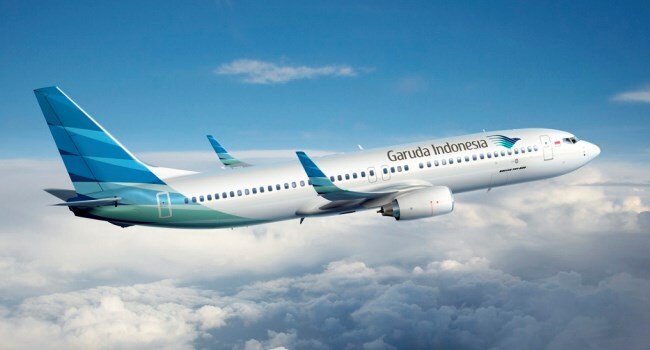 Garuda Indonesia deserves a new reputation; one that reflects the impressive improvements in service and style. Bali has an exotic array of five star resorts ( TLTB was heading to the legendary Oberoi - review coming in January) so it is good to have a luxury option in terms of getting there direct from Australia. Jetstar just won't cut it.